Two years ago our good friends Josh & Julia, both artists, moved to Chiang Mai for the year. We vowed to visit them, but the year flew by and we never made it. Thanks to them we arrived equipped to kick off our own Thai Scavenger Hunt and check off the golden nuggets of their must-see list! The BEST part of Chiang Mai, however, was a visit from my Mamma! She met us there and traveled with us for almost two weeks, such a treat! And to top it off, we met up with her friend Gao, a local, who she’d hosted in Fairbanks years ago. Gao wins the award for best host of all time, sharing all his local favorites, bringing us presents every day and literally offering Eric the (sweat)shirt off his back when he lost his! Gao super charged the Ultimate Chiang Mai Scavenger List you find below. Who’s up for a HUNT!? This visiting monk approached E at the Bhuping, the Royal vacation palace and made friends. He said he wanted to practice English but I think it was the pants. After massage treats, Fah Lanna Spa. Sweet cashew rice cakes in the middle are my fav. On a temple tour day with Gao we stumbled upon a group rehearsing for some fancy official visiting later that day. Gao sweet talked them into letting us watch and suddenly they did a full start to finish show for us! WHO KNEW Thai women could bend their hands back so far!? Snuggling for warmth, Mon Cham. Chaing Mai is temple city and we got our fix. One of my favorite moments of the trip was kneeling for a Buddhist monk’s blessing at Wat Doi Suthep, holy water being splashed generously across my face, as he chanted the blessing and then translated “Happy life, happy everything!”, and tied a white blessing thread around my right wrist. As I basked in the glow of my newly blessed self and ambled around the temple, a mantra started to form in my mind – an amalgamation of teachings slowly converging. I’m not really sure where it came from, but whoever/whatever the source, thank you! May you have the courage to follow. I immediately scribbled it in my journal and flip back to it often. There’s wisdom in them there words. Thai Spirit House – a place to keep you your mischievous house spirit (think Dobby the house elf) appeased and out of trouble. Best placed in the corner of your garden. Fact: The Thai love to dress their dogs in sweaters. Even the mangiest street dogs seem to be styled out. When I asked why, I was told it’s winter and they are cold. Fair enough, I was surprisingly chilly myself. My favorite was the temple dog in the Angry Birds hoodie (not pictured). And Catasauraus, priceless. The one photo where you can’t tell holding on for dear life! The Ultimate Chiang Mai Scavenger List! Sri Pat Guesthouse Ask for a room with a balcony. Splurge for Deluxe (1700 bhat) if you want a nicer room (wood vs tile, nicer balcony) but the Standard Room (1100 bhat) was same size and fine for us. Staff is lovely and will help you arrange tours and transfers. Location is great (Old City). Breakfasts are amazing, eat the ham/cheese/egg sandwich. Get a massage every day. Try every massage on the menu. The Massage place to the left of Sri Pat guesthouse if you face it is excellent. 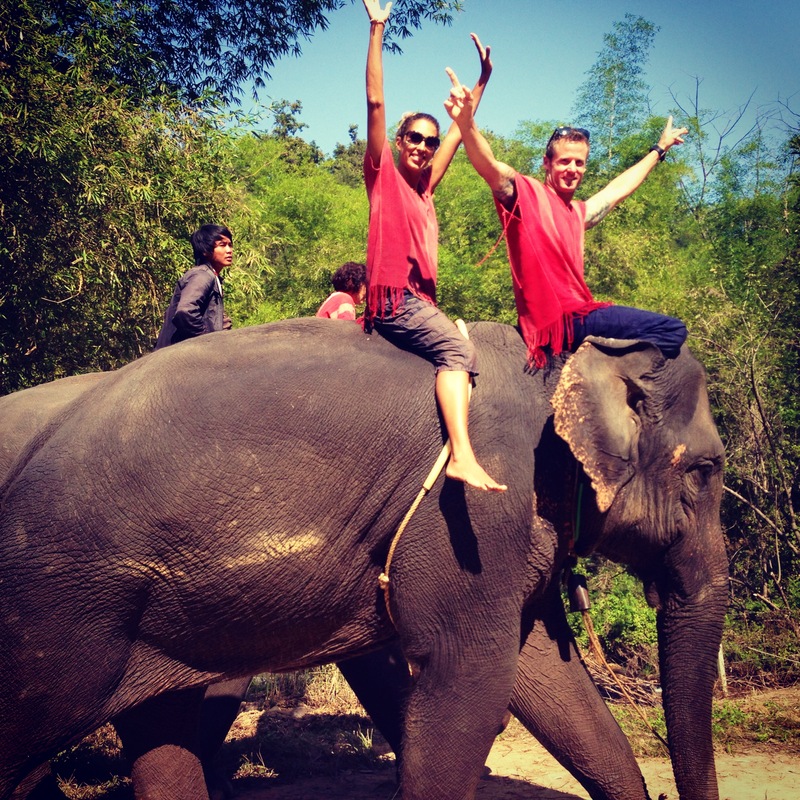 Spend a day with the Elephants! We went to Ran-Tong Elephant Rescue and loved it, and have also heard Elephant Nature Park is wonderful. Not to be missed! Book a few days in advance. Here’s a quick video of our day. Wat’s Wat’s and more Wat’s – bring a wrap to cover your arms. Wat Suan Dok – eat at Pun Pun next door and sign up to have a chat with a Monk. Rent a motorcycle (with helmet! ), barter for weekly rate, and cruise town. Drive up the mountain to Wat Doi Suthep. Get blessed by a monk. Take the blue trucks instead of tuk tuk’s – you may stop a few times to pick up other passengers and take a round a bout way but its much cheaper and a fun way to explore the city. Skip the Saturday night market (touristy) and go to the Sunday Walking Street Market. If you are there at 6pm prepare to feel like you’re in a time travel movie when everyone freezes for the King’s Song. Buy a pair of Thai pants and if you need a new journal they have leather and suede bound gems for $15. Get your downward dog on with Weena at Weena Yoga. Smile and laugh when she takes out the camera and photographs you mid pose. Tell her Josh & Julia’s friends sent you. Go with moto or car to Mon Cham for stunning sunset. Camping available too! 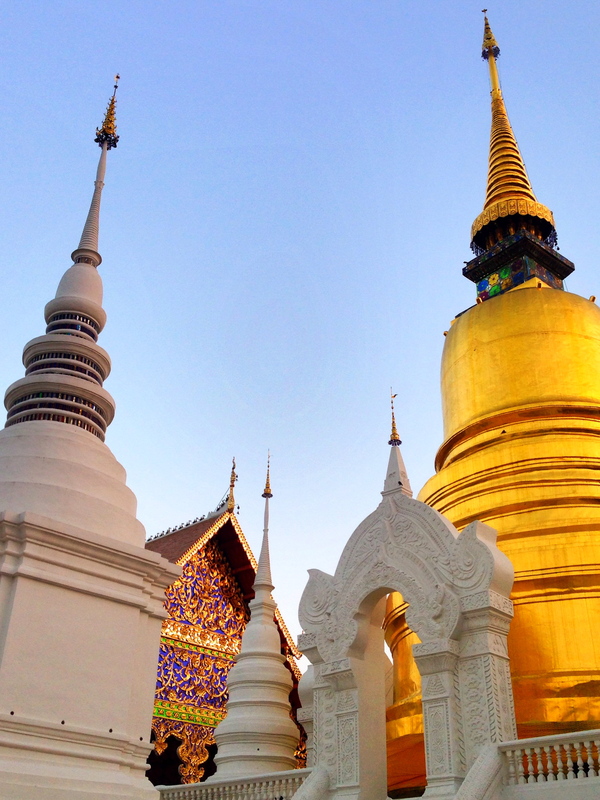 Got something to add to our Chiang Mai list? Comment away! Well, what can I say! Your blog is incredible. I love your writing and your photographs. It’s really an inspiration. I took a look at your friends Josh and Julia’s links. I think they are both so talented. Julia’s work flipped me out, especially her site-specific installation in Thailand. Do you know if she shows any of her work in the Bay Area? LOVE your posts and photos! And thank you again for 2 amazing weeks with you both! Such great memories !